I had dinner at a Taiwanese restaurant that recently opened in Milpitas (in the bigger plaza off Dixon Landing Road). My three friends and I were craving stinky tofu so we ordered two different kinds, deep fried stinky tofu (the most popular version) and mala stinky tofu. I will focus on the latter kind in this post. 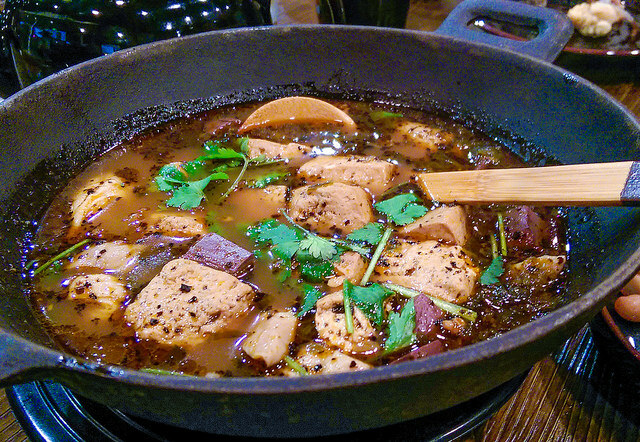 The name of the dish in Chinese is 麻辣臭豆腐 (málà chòu dòufu), which translates to “spicy stinky tofu” or “mala stinky tofu”. Chi’s mala stinky tofu included pig blood curd (豬紅, zhū hóng; also called blood tofu or blood pudding), pig intestines, and cilantro. The mala stinky tofu dish went well with a bowl of rice, and was perhaps the best dish of the night. This dish was emptied out within minutes and we fought over the last piece of stinky tofu, intestine, and blood tofu! I had the deep fried stinky tofu Saturday night. Was delicious! I look forward to trying out this version of it! !